We reached our goal! BOY, DID WE REACH OUR GOAL!!!! ACTUALLY WE BLEW OUR GOAL OUT OF THE WATER!!! And now, thanks to YOU, our fantastic donors, we can! The Big Give is over. We beat our goal...but that doesn't mean the need is over. If you missed your chance to donate to the Big Give, you are, of course, still welcome to support Triple H any time. Just click the donate button in the footer below. And this time, instead of a one-time donation, consider the option of donating a recurring monthly sustaining donation. ​JUST CLICK THE DONATE BUTTON IN THE FOOTER BELOW! TRIPLE H BIG GIVE STORY #1—Read about Hannah, her dad David and her Therapy Horse Coors. 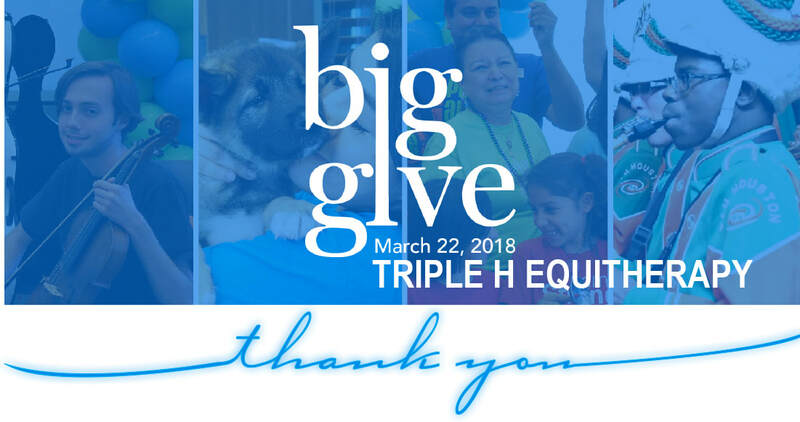 TRIPLE H BIG GIVE STORY #2--Read about the "life-changing" done all the time by our Horse Therapists at Triple H Equitherapy.